A genomic analysis of 28 dog breeds has traced the genetic history of the remarkable Fonni's Dog, a herd guardian endemic to the Mediterranean island of Sardinia. The results, published in the journal GENETICS, reveal that the regional variety has developed into a true breed through unregulated selection for its distinctive behavior, and that its ancestors came from the very same geographic areas as Sardinia's human migrants. Just as Sardinian people have long provided a wealth of genetic insights to scientists, the canine natives are an example of an isolated population that could prove a powerful resource for finding genes that influence health and behavior. Fonni's Dogs (Cane Fonnese in Italian) are large, rugged dogs known for their wariness towards strangers and their intense facial expression. Although there are descriptions of these shephard's companions dating to at least the mid-nineteenth century, it is not officially recognized as a breed by most international registries, including the largest federation of kennel clubs, the Federation Cynologique Internationale. "If you were to look at ten Fonni's Dogs, you would see there's a lot of variation in coat color and fur length. But they are all good protectors of their flocks. That's because nobody cares what they look like; they've been bred to do a job and to do it right," says study leader Elaine Ostrander of the National Human Genome Research Institute (NHGRI). That job is guarding the possessions of their owner, to whom they are fiercely loyal. "Fonni's are also outstanding thieves," says Ostrander. "They can be trained to sneak over to the neighbors' and bring items home." While this particular duty isn't required by today's Fonni Dogs, written records from the mid-1800's indicate that thievery was part of their historical repertoire. The island home of the Fonni's Dog has long held the interest of geneticists. Because Sardinia is geographically isolated, its human inhabitants share a unique ancestry and relatively low genetic diversity. Those characteristics make it easier to study genetic influences on disease and aging in Sardinians than in other human groups. Ostrander and other canine geneticists argue that each of the hundreds of different dog breeds also represents an isolated population that could be harnessed for genetic studies. "Dogs get all the same diseases as humans, and there are lots of dog breeds with genetic predispositions, for example to particular types of cancer," Ostrander says. "Once we understand the genetic history of a breed we can search for disease genes in a much more powerful way than is possible in humans, enabling us to hone in on medically-relevant genes." To better understand how the Fonni's Dog developed, scientists from the NHGRI, the University of Milan, and G. d'Annunzio University analyzed blood samples from Fonni's Dogs living in different parts of Sardinia and sequenced the whole genome of one of these dogs. To trace the Fonni's relationship to dogs from around the Mediterranean, the team compared the data to DNA from 27 other European, Middle Eastern, and North African breeds. 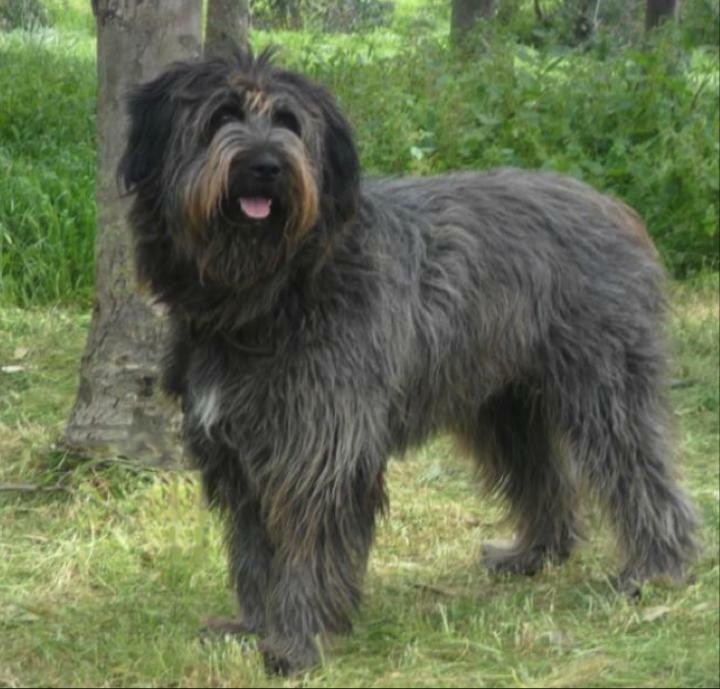 The data revealed that the Fonni's dog shows all the genetic hallmarks of being a breed, even though it developed in the absence of a regulated pedigree program and only arose through the tendency of Sardinian shepherds to choose their best guard dogs for breeding. The researchers compared individual dogs from within the same breed and across different breeds, quantifying many aspects of genome variation and genetic distinctiveness. All these measures confirmed that the Fonni's Dog, in genetic terms, is a breed. The study also revealed the ancestors of the Fonni's Dog were related to the Saluki, a swift and graceful "sight" hound from the Near and Middle East, and a large mastiff like the Komondor, a powerfully-built sheep guardian from Hungary that looks a bit like a mop. Strikingly, the origins of the Fonni's Dog mirror human migration to Sardinia. Studies of the island's human inhabitants have shown they share greatest genetic similarity with people from Hungary, Egypt, Israel, and Jordan. "The map we can draw of the dog's origins is the same as the map of human migration to Sardinia," says Ostrander. "Clearly ancient people traveled with their dogs, just as they do now." The close parallels between the history of the dog and human inhabitants of the island has a practical implication, says Ostrander. "Our study shows how closely dog migration parallels human migration. It could be that if you have missing pieces in a study of a human population's history, samples collected from dogs in the right place could fill in those gaps." The team plans next to study in greater detail eleven regions of the genome that likely make the Fonni's Dog distinct — these may be responsible for their characteristically loyal and protective behavior. Ostrander points out the study was a collaborative effort with scientists from Italy, including Sardinia, and says she is gratified to find so many researchers across the world interested in similar questions. Her group is hoping to work with colleagues in a range of countries to explore other so-called "niche" dog populations, regional varieties that often have a history of being bred for a particular job. Their goals are to better understand how dogs have evolved and to demonstrate yet another important job for these faithful human companions: tracking down disease genes.